are nicely balanced and provide plenty of dil-squish and other forms of emotional satisfaction. Everyone in it is solid. 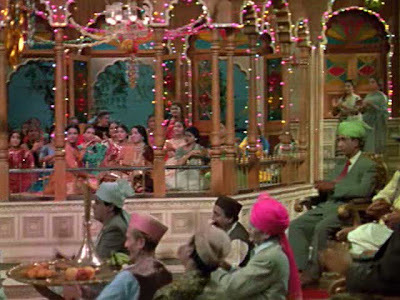 The songs are lovely (my favorite was "Din Hai Bahar Ke," Sharmila and Shashi's college outing on what appears to be a pontoon dance floor on a lake). Japanese pop culture-themed exception: my only criticism of the film is that the protracted courtroom sequences stomp Godzilla-like over the last quarter or so of the run time, destroying all the other threads of the story and monopolizing far more of the script than I would like. 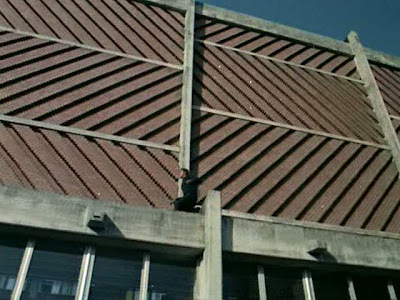 However, we are very accustomed to films faltering post-intermission, and we've seen worse falls from grace than this. And in the final scene, the courtroom becomes Katamari, though with better music, and rolls all the characters up into one giant ball of happy, so it's hard to be too angry at it. It just drags for awhile. 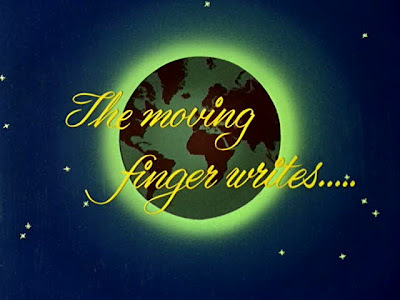 So: good movie with a few slow bits. 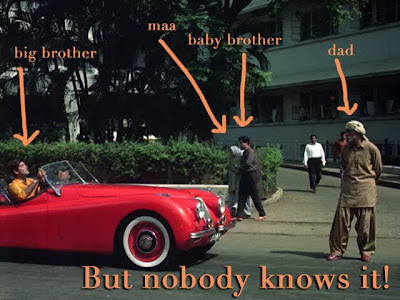 If you want to know more about who's who and all the different threads, like which son ended up a thief and which one a goody-goody law student and which one poor but mere paas maa hai, read Memsaab. 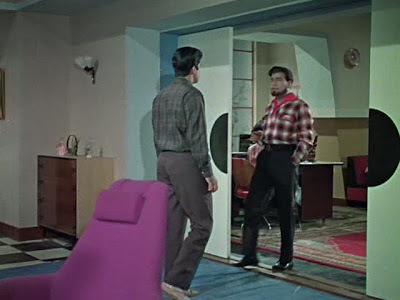 What I love most in Waqt is the STYLE. Oh sweet heavens above, THE STYLE! Set designers, location scouts, costume designers, and cinematographers all went wild in the best possible way. Fountains, fairy lights, flowers, fireworks! The fashions are divine. The interiors are so mod, geometric patterns dazzling. The outdoors are so breezy and in bloom. 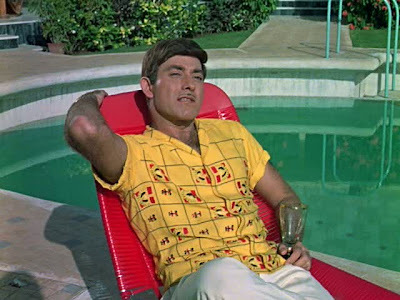 The colors everywhere signify candy-coated exuberance from a mindset of "artificial" being optimistic - the pastel palette of human dominance (no doubt to contrast the completely accidental life-altering tragedy in the characters' history). Even the flowers are synthetically hued. Sunken living rooms that seat 37 always make me happy. 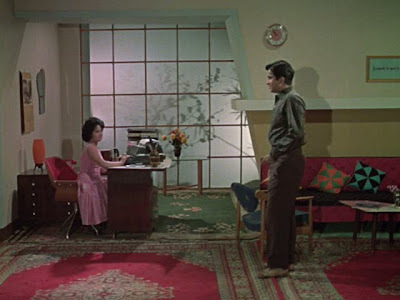 Don't all criminal offices have pinwheel quilted cushions and orchid lounge chairs? It makes me want to move into Waqt, ask Sadhana to take me shopping, join the dock party, and bliss out on the aesthetics. 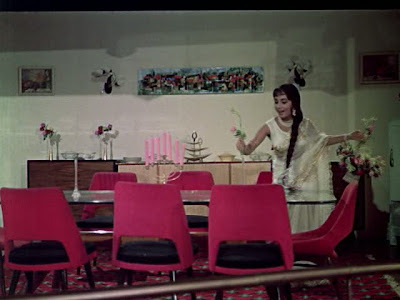 Being the heroine's dorky best friend with oversized glasses and clowning around with the goofy Rajendra Nath type for a week sounds like a swell vacation, doesn't it? 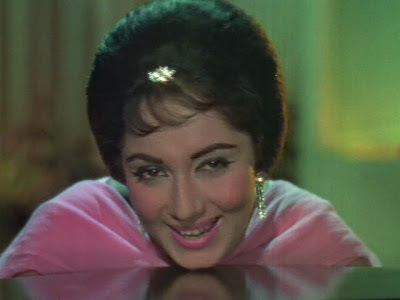 Aah the glorious styles of Waqt. 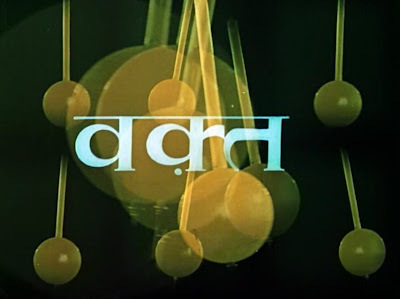 The movie is glamorous even by today's standards! And Sadhana is credited with starting the fashion of churidar pajamas (tight pants) instead of the usual salwars (loose pants) with kurtas. I like the color non-conventional color choice for men-women change-room doors ! the stylization and lost-family storyline is quite admirable, it set the standards for many future movies followed. 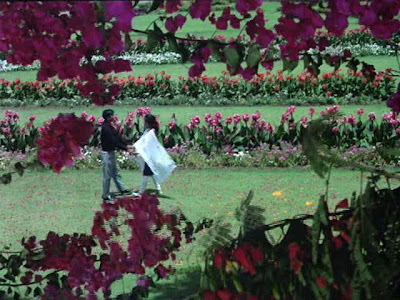 Oh yes, And didn't you love Sadhana's house in Mumbai with a lake in the backyard where she goes boating? Want it so bad. I'm putting it on my list right away! 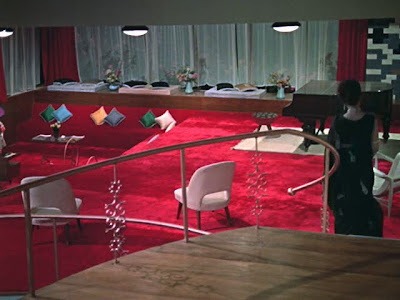 Also, I would really love a giant canopied round bed. Any idea's where I can get one! 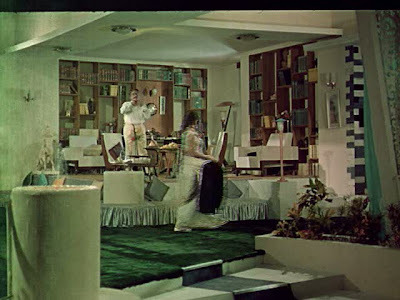 Bollyviewer - I love how it's glamorous but not quite tacky - it seems like many of the late 90s and early 2000s movies equated wealthy with insanity. This one is...well, it's a lot, but it's not hideous. 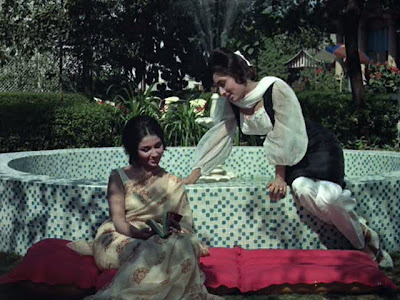 I adore Sadhana's fashions! Want want! Anon - I hadn't even noticed that. Good eye! JJC - I can easily imagine! BB - It's definitely fun. The courtroom stuff really does drag on, and there's no romantic or comic or anything else relief once it starts. But all in all, v g.
Banno - YES! I did love that! With the neat colored tripod contraption to hold up one end of her hammock! I don't know if the changing room door colors were chosen deliberately. But in general, the Pink/female and Blue/male color code has very little significance in Indian culture. Maybe it was just incidental. Does the Bollywood multi-starrer get any bigger than this? NO. Emphatic NO. 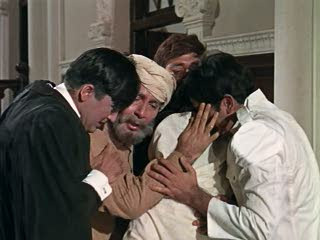 Balraaj Sahni, Sunil Dutt, Raj Kumar, Sharmila Tagore, Shashi Kapoor, Sadhna..I am speechless...ok the word is Blimey! Loved the songs so much in this. And I was so happy that the courtroom scene was actually believable, with sane, coherent arguments on both sides and people conducting themselves circumspectly (mostly) that it didn't drag for me. 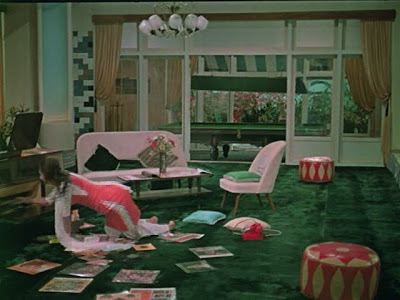 And I loved the pink rooms and furniture. Pink is good. Ditto with Memsaab on the pink factor! Ok, so onto the list this one goes. :) I can't tell you how relieved I was to click on this link and see it was the classic "Waqt" you reviewed as opposed to the nightmare from 2006(Starring Akshay, Priyanka, and Big B). The fact that you said the film didn't drag sold me. 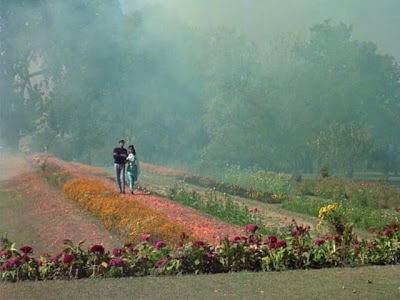 I'm usually not a Yash Chopra fan because I've noticed some of his films do just that (like "Silsila" and "Dil To Pagal Hai"). I love the photo with the arrows! Also, sorry I haven't been by in awhile. Been so busy with school! 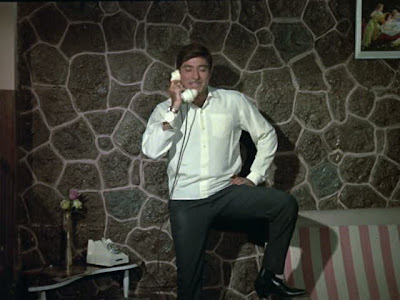 I've still been reading, though and really enjoyed your posts on Shashi Week, though I haven't seen many of his films so didn't comment on anything. Good review as usual Beth. Love the screen caps and your commentary esp the one with arrows! Must confess - haven't seen this movie tho i have heard/seen songs on Radio/ TV (while growing up). I wonder how i can get hold of this Down Under? Love the character diagraming in the first pic, Beth! 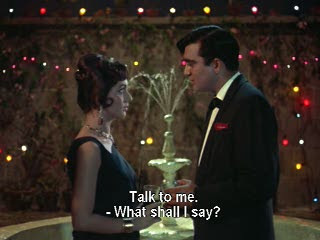 I love the shoes Sadhana wears - she has such pretty ones in this movie...and I've now realised, with the wisdom of age :-) that Sharmila's sari-sleeveless-blouse combo is absolutely to die for - I don't think I ever noticed it before! hi guys...where can i find the english subtitle for this movie? i've heard of all those good reviews and have a dvd for this title but without english sub. Anyone can help?